A haunted bell, made from the armor of a cruel baron who was murdered by the peasants of his village, which foretells disasters. A beautiful woman whose suitors are flee from her, screaming, when she is alone with them. A school of magic with a terrible price. An angry mermaid that grants wishes that turn back upon the fisherman who angered her. You’ll find these and other frightening folk tales in More Bones: Scary Stories from Around the World by Arielle North Olson and Howard Schwartz. This book retells 22 stories from diverse places, such as Ireland, Germany, Egypt, Spain, Japan, China, and more. This book is very much in the vein of Scary Stories to Tell in the Dark, though aimed at a slightly older audience, and with somewhat less frightening illustrations drawn by E. M. Gist. Also like that book, More Bones includes a bibliography listing the sources of the stories retold within. This is a nice feature, especially since the books are generally old enough to be in the public domain, like Fairy and Folk Tales of the Irish Peasantry by W. B. Yeats. The stories are something of a mixed bag. Some of them are quite good, if simple, like “Youth Without Age” or “The Severed Head,” while others are fairly dull, like “The Haunted Violin.” There are more hits than misses, though. 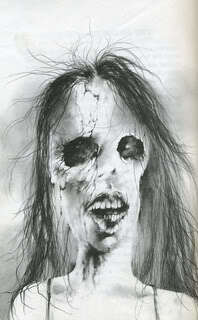 Some of the artwork is close to being as frightening as that in Scary Stories to Tell in the Dark, though I don’t like it quite as well. This may just be a result of nostalgia, though–the illustrations are good. More Bones is a great book for someone who wants something a little more mature than Scary Stories to Tell in the Dark, and the bibliography will provide plenty of additional stories, for those who are interested. Definitely pick it up if you’re interested in scary folk tales. For those who prefer ebooks, More Bones is available for the Kindle, too.